Apple Hospitality REIT is a promising REIT in the lodging sector. The REIT has a large, diversified hotel portfolio that includes the world's most high-profile hotel franchises. Apple Hospitality outearns its dividend with funds from operations, but has a volatile payout ratio. Shares are moderately valued. I added APLE to my high-yield income portfolio this week. An investment in APLE yields 7.3 percent. I added Apple Hospitality REIT, Inc. (APLE) to my high-yield income portfolio this week because the REIT provides income investors with stable dividend income that is backed by recurring cash flow from the company's large and diversified hotel portfolio. 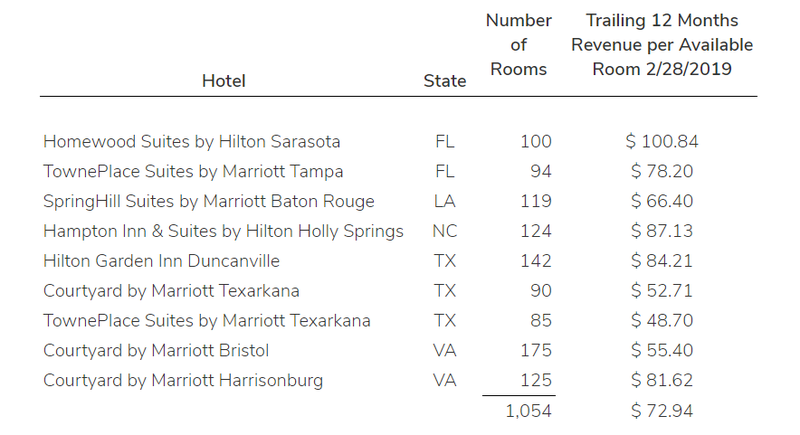 The hotel REIT has strong relationships with Hilton, Marriott and Hyatt - America's top hotel brands - and outearns its dividend with funds from operations. Apple Hospitality REIT is a cyclical bet on a continued economic upswing in the United States. Apple Hospitality REIT's real estate portfolio was comprised of 241 hotels representing 30,812 rooms at the end of the December quarter. 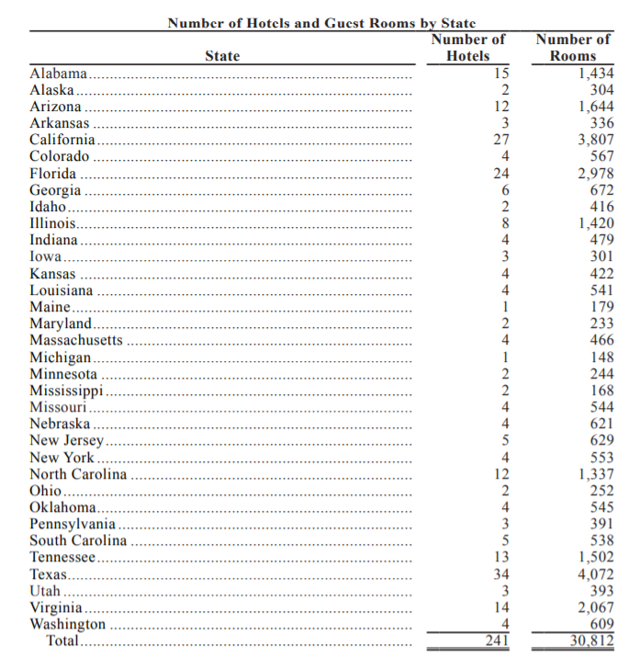 The real estate investment trust's select-service hotels can be found in 34 U.S. states and have a large concentration in urban- and sub-urban markets. The majority of the REIT's properties are associated with large U.S. hotel brands - Hilton, Marriott and Hyatt - that benefit from high name recognition and can command premiums for their service offerings in the market. 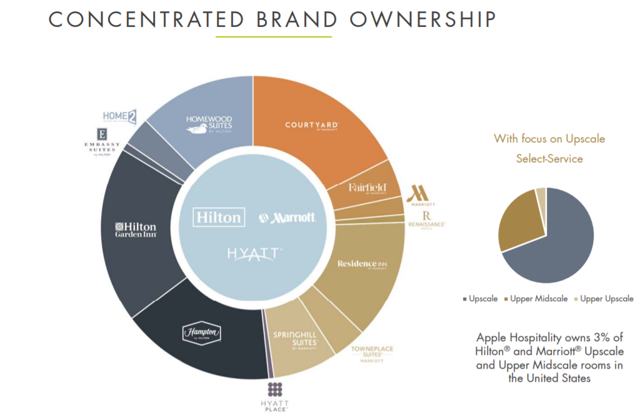 The Hilton Garden Inn currently has the highest brand-representation in Apple Hospitality REIT's hotel portfolio, closely followed by Marriott's Courtyard and Hilton's Hampton brand. Texas currently consolidates the largest share of Apple Hospitality REIT's hotels of any state (34), followed by California (27) and Florida (24). At the beginning of the month, Apple Hospitality REIT announced that it completed the sale of nine hotels for $95 million, and the proceeds were used to repay debt under its revolving credit facility. 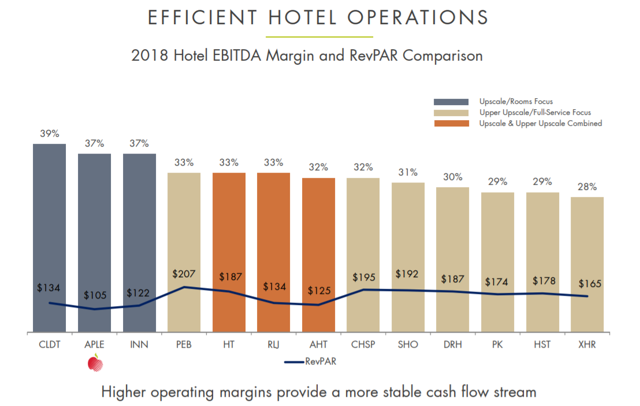 Apple Hospitality REIT has not the highest EBITDA margin in the sector - Chatham Lodging Trust (CLDT) has - but it comes close: Apple Hospitality REIT's EBITDA margin in 2018 was 37 percent, the second highest in the sector. Apple Hospitality REIT's RevPar at the end of December 2018 was $104.66, reflecting a slight improvement of 0.5 percent over the previous year. RevPar stands for Revenues Per Available Room and is a key stat for hotel REITs to measure performance. And here's Apple Hospitality REIT's RevPar trend over the last five quarters, reflecting the industry's seasonality. 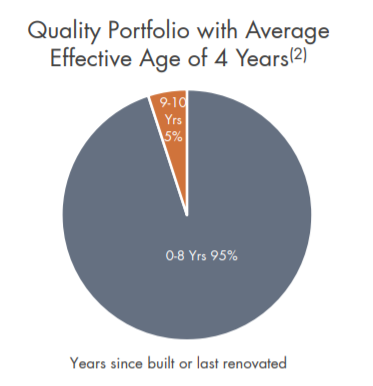 Apple Hospitality REIT has a very young portfolio with an average effective age of only four years, which obviously improves the appeal of the REIT's hotel portfolio for both guests and investors. The growth forecast for the U.S. hotel industry is moderately positive: The industry's RevPAR is expected to grow between 2.3-2.5 percent in 2019 and between 1.9-2.0 percent in 2020. 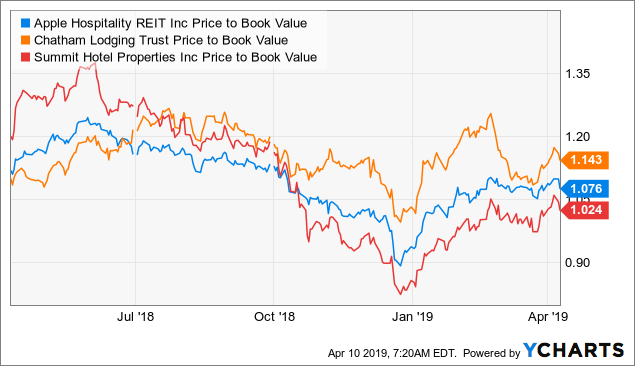 Apple Hospitality REIT does not grow its dividend payout and the hotel REIT has a volatile payout ratio, thanks to the seasonality in the lodging industry. Apple Hospitality REIT's modified FFO payout ratio has fluctuated between 59-83 percent in the last five quarters (average payout ratio: 74 percent), but the company has covered its dividend in every single quarter regardless. 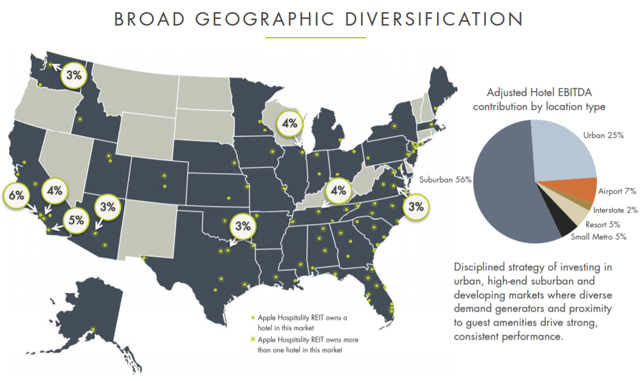 Here are Apple Hospitality REIT's distribution coverage stats. Apple Hospitality REIT pays a $0.10/share monthly dividend which the company is NOT growing. Since shares today sell for $16.38, an investment in APLE yields 7.3 percent. Apple Hospitality's shares are still rather moderately valued and are not selling for too high an FFO multiple: The REIT's dividend stream currently sells for ~11.4x Q4 2018 run-rate modified funds from operations. Income investors also pay a slight premium to book value, but Apple Hospitality's P/B ratio ranks about midfield in its peer group. 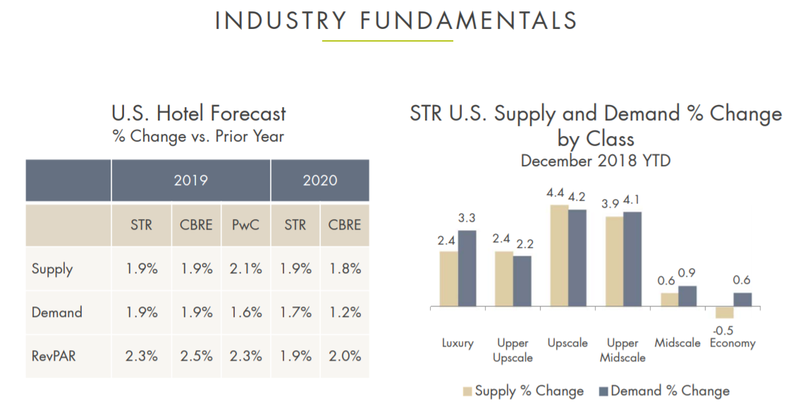 Apple Hospitality is a cyclical hotel real estate investment trust that is doing well in an economic upswing and that is likely going to experience RevPar and cash flow declines in an economic downturn as travelers cut back back on traveling and accommodation expenses. Hence, Apple Hospitality REIT's shares could trade considerably lower in case a U.S. recession manifests itself. I just added a small position in Apple Hospitality REIT to my high-yield income portfolio. Apple Hospitality REIT is quite a profitable lodging company based on EBITDA margins and has a strong property portfolio consisting of high-quality hotel brands. RevPar growth is projected to be positive in both 2019 and 2020 as long as the U.S. economy doesn't slide into a recession. 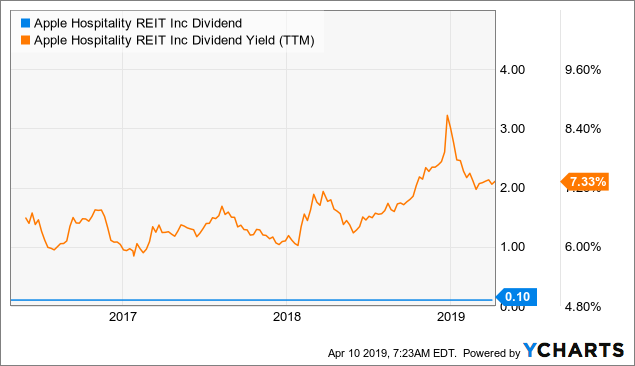 The real estate investment trust's dividend stream is not overpriced yet, and the company covers its monthly payout with funds from operations. Buy for income and capital appreciation. Disclosure: I am/we are long APLE. I wrote this article myself, and it expresses my own opinions. I am not receiving compensation for it (other than from Seeking Alpha). I have no business relationship with any company whose stock is mentioned in this article.